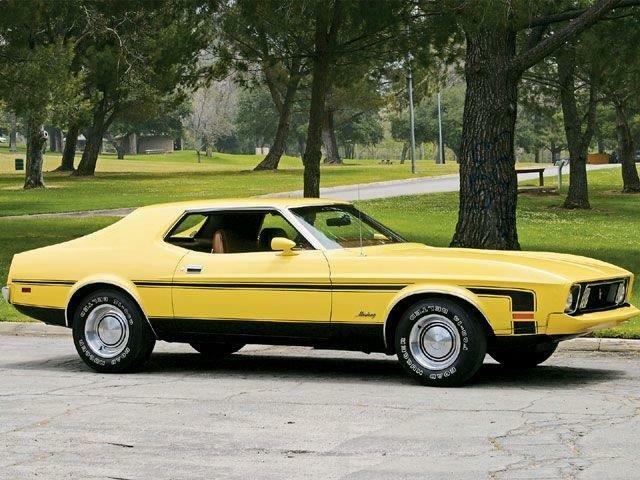 7173MUSTANGS.com › General Discussion › 71-73 Mustang Talk › Grandé › Was there ever a 73 Spring Special Coupe? My 73 Grandé Coupe needs a serious paint job and body work. I like the look of the Spring Special to muscle it up with the nasa hood and accent stripes. Would the "Mustang Faithful" ever know if it was even a Ford production model or option? In my opinion, the stock Grandé is too wimpy looking. Will this greatly reduce the value or does it really matter? In the end, it's my car and my choice, right? There was not a package offered in 73 that I know of. That being said you could order the side stripe on coupe if you got the Decor Group that gave you the Mach 1 grill and lower black out. You could also get the NASA hood on any model and also the hood black. You can do what you want with your car no regrets. Not to my knowledge. The Decor group (and tape stripe) was not available on the Grandé', but you could get the NASA hood and the TuTone hood paint with locks. I personally wouldn't put tape stripes on a Grandé', but the spring Special is a nice looking option if you want to go that way. (04-13-2019, 09:34 AM)Hemikiller Wrote: Not to my knowledge. The Decor group (and tape stripe) was not available on the Grandé', but you could get the NASA hood and the TuTone hood paint with locks. 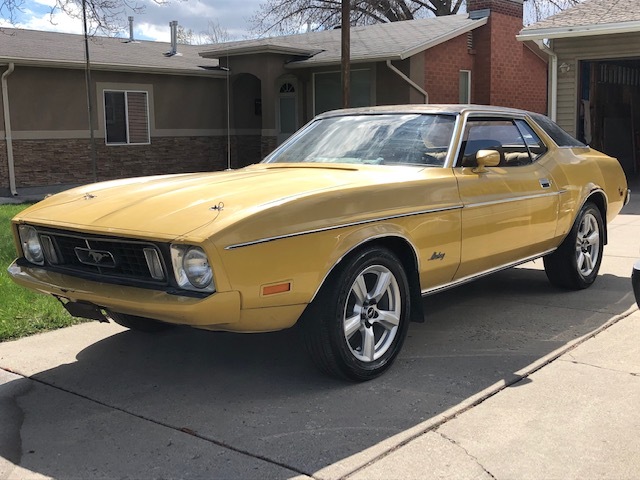 When I had my 73 Grandé, I wanted to put on the NASA hood and Mach1 grill as well as either aluminum slots (probably aftermarket to get 15x7s) or Magnums. No stripes for me, but I figured the black front spoiler would balance out the black camera case panel on the backend and the vinyl top. This was on a Bright green gold car. Simple, relatively uncluttered. 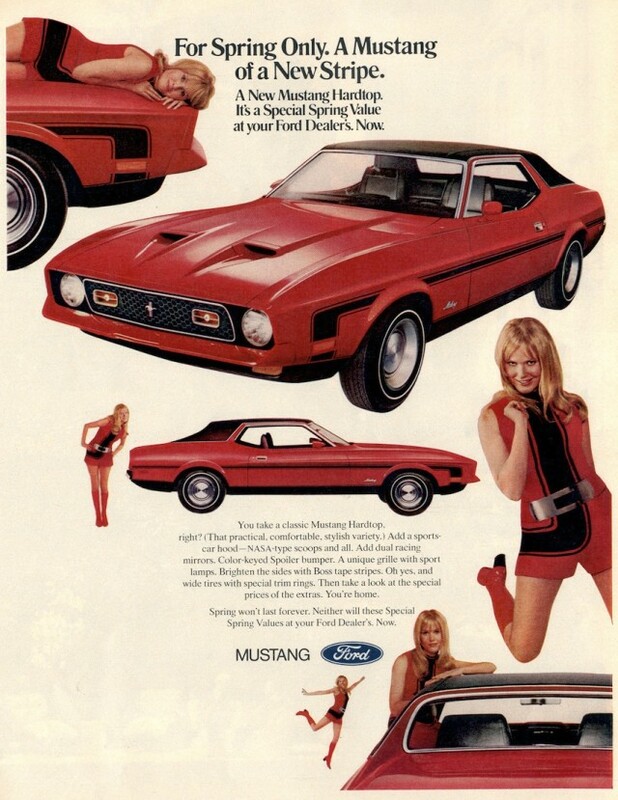 According to Utah DMV, if you match yours to the Ford ad, then you are obligated to wear the matching jumpsuit, too. (04-13-2019, 09:17 AM)Mikesro Wrote: My 73 Grandé Coupe needs a serious paint job and body work. I like the look of the Spring Special to muscle it up with the nasa hood and accent stripes. 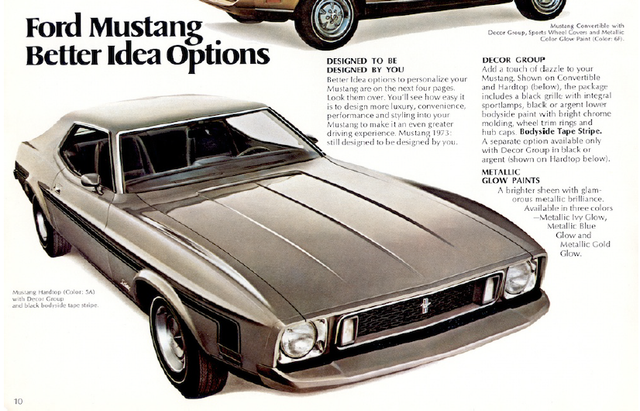 Would the "Mustang Faithful" ever know if it was even a Ford production model or option? In my opinion, the stock Grandé is too wimpy looking. Will this greatly reduce the value or does it really matter? In the end, it's my car and my choice, right? Hey Mike, I am curious... where did you find the picture of the yellow coupe above? The car next it is/was mine. I took the pic back in July 4th 1998 at the MCA National show in NJ. Maybe I post it on the forum but I don't remember doing that. Here is the whole pic. 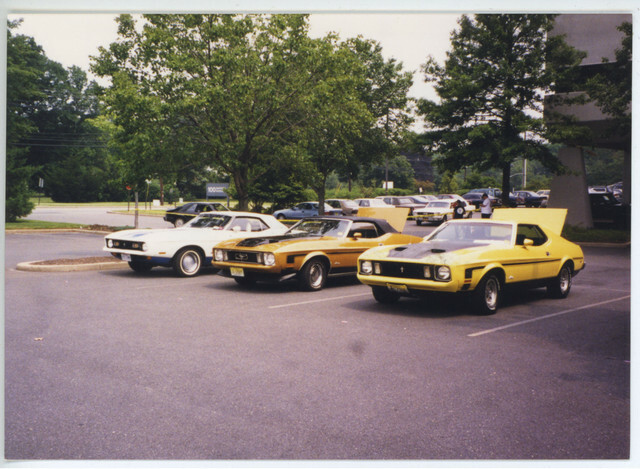 That yellow 73 Hardtop/coupe was a nice original 351C 4 spd car with the Decor, Nasa hood, Aluminum slot wheel options.